I have always been a fierce animal lover and consider myself to be a conservationist in the truest meaning of the term. And yet, how I approach animal experiences when I’m traveling has been an evolution. It wasn’t a change in thinking; I’ve always wanted to help protect all animals. No, instead it’s been an evolution of understanding. Of truly comprehending which animal experiences are and aren’t responsible and how the actions we take as tourists can significantly impact the lives of animals around the world, both in positive and negative ways. I’ve made a lot of mistakes over the years and I am honestly ashamed of those errors. They were born of ignorance though and not malice and I’m willing to bet that I’m not alone. I think that the vast majority of travelers simply don’t understand the impact they have on animals when they attend a show or visit a fake sanctuary. The ramifications are intense and there is perhaps no place in the world where this is better seen than in Thailand. Before I become a little judgey, I want to first confess some of my travel sins. It’s hard to write about these and I do so with more than one tear in my eye, but it’s important I think to show how I have erred so that others can avoid feeling as I do. On my first trip to Thailand I spent several days on the tropical island of Koh Samui. A large private suite at a luxury hotel, fruity drinks with umbrellas and a gorgeous beach – these were the main reasons why I wanted to visit this famous island retreat. I also decided to try an excursion one afternoon, riding an elephant. All I can say now is that I was young and stupid, relatively inexperienced in the world of travel and naïve when it came to understanding the ramifications of my travel decisions. Given my natural love of animals I feel drawn to them when I travel, and I stupidly signed up for an elephant encounter. That ‘encounter’ involved riding around on top of these beautiful animals in the middle of the jungle. The thing is, as soon as I arrived I knew it was wrong and after sitting on top of that poor elephant I instantly sensed his sadness. Just looking into his eyes I saw a misery and pain that I never want to see again. I left the site immediately, seething from anger and frustration. I was angry at myself for not knowing better and frustrated at my own inability to affect change on any level. Even today I tear up thinking about that poor elephant and the elephant ride; it touched me that deeply. I wish I could say that was my only mistake over the years, but it’s not. In South Africa I visited a lion sanctuary that turned out to be an abuse factory, in Mexico I swam with dolphins and I have visited far too many zoos over the years. I have failed to be a responsible traveler many times, but not anymore. I now fully understand what these experiences do to the animals and instead, I seek out those rare opportunities around the world that help instead of hurt. 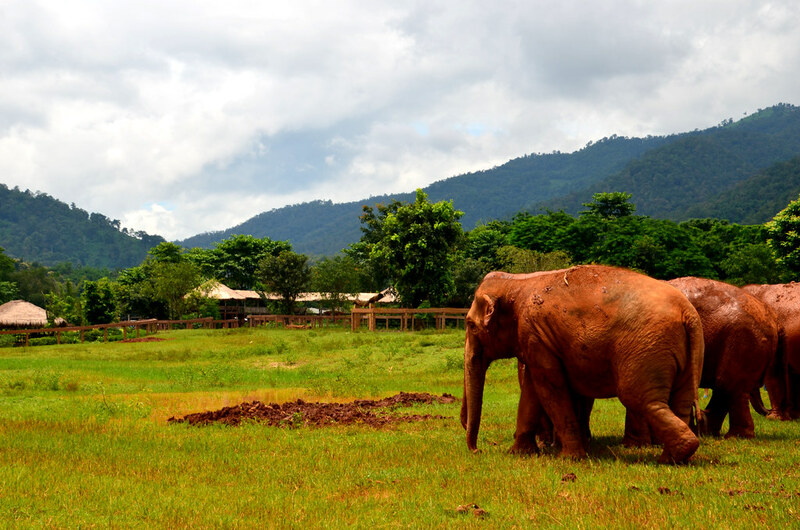 On my most recent trip to Thailand I spent a day volunteering at one of those facilities, the Elephant Nature Park outside of Chiang Mai. Three years ago, I featured an interview on LandLopers with Diana Edelman. At the time she was working with the Save Elephant Foundation and the Elephant Nature Park and she still is one of the leading blogger experts in all things relating to elephant tourism. In that interview she made several important points that I think bear repeating. They clearly outline why the vast majority of elephant tourism activities around the world aren’t just to be avoided, but they actually contribute to the slow torture and ultimate murder of elephants and other animals in ways that would shock most tourists. What follows is a partial reprint of that important interview. There isn’t one specific issue as it relates to elephants and tourism activities around the world. There are quite a few, which makes elephant tourism a very tricky subject. The first thing people need to know about elephant tourism is that the elephants they see in the trekking camps, the circuses, the painting classes … they have all gone through an abusive and torturous process to break their spirit. While some argue that this is not the case, that elephants enjoy performing and want to learn, but I can say that based on my personal experience working in elephant tourism for some time now along with discussions I’ve had with leading elephant conservationists, this is not the case. Every elephant that is captive has been put through a process called “the Crush.” In Thailand, it is known as the “phajaan” and throughout Southeast Asia it has different names, depending on the country. This breaking of the spirit involves a young elephant, often times captured from the wild and his or her family slaughtered, who is then confined to a small wooden corral for about a week. During this time, the elephant is shackled or tied (all legs) so the animal cannot move, and then ritually beaten with bamboo topped with nails, bludgeoned with bull hooks, deprived of food and water and taught basic commands. At the end of this process, the elephant is said to be “broken” and no longer has bonds to the family – which is incredibly strong in the wild. From there, depending on where the elephant goes, the abuse continues. Street begging is perhaps one of the most dangerous and abusive “occupations” for captive working elephants. These elephants are young and have already gone through the Crush. They spend days and nights pounding the pavement with their caretaker (mahout in Thai) and beg for food. There are many issues with street begging elephants. Oftentimes they are drugged to keep walking and working. Their feet are sensitive and walking on pavement means they feel every rumble. Their feet shouldn’t even be on the damaging pavement in the first place; elephants need a jungle terrain. They often do not get the necessary amounts of food, water, access to dirt, shade or rivers to cool off in. Elephants are highly social creatures and are capable of experiencing emotions just like people. Sadly, the life of a street-begging elephant is a solitary one where much-needed socialization does not go on. There is also of course the threat of getting hit by vehicles, which is a regular occurrence. Many of the issues with street begging carry across the entire elephant tourism industry. 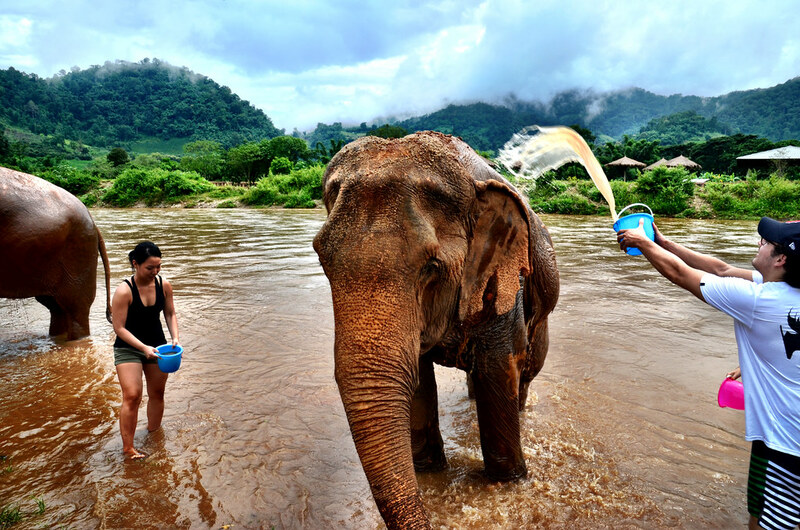 For example, elephant trekking has the same issues regarding food, water, shade and so on. There is also the houda or bench. Research has shown that an elephant’s back is not made to carry a heavy bench and especially not one laden with people atop that bench. Their spines are not like horses or other animals that people ride. Instead, the only way an elephant should be ridden (although my personal opinion is not to ride one) is on the top of the head. Circuses, shows, sports and elephant painting also face an entirely different set of problems, namely the additional training of the elephant to perform. Training involves a hook that is placed in the animal’s ear with a string attached to it, so whenever the elephant does not listen or makes a mistake, the ear – the most sensitive part of an elephant – is cut with the hook. There is also the bull hook, a long stick with a metal hook attached to it. This is used to get the elephant to listen. At the end of the day, I suppose the greatest issue is the demand for these animals to be exploited for people’s entertainment. They must either be allowed to live naturally in the wild and/or moved from irresponsible tourism activities to more responsible ones where their owners can still turn a profit without causing further harm to these beautiful animals, thereby eliminating the demand for captive working elephants on such a large scale. 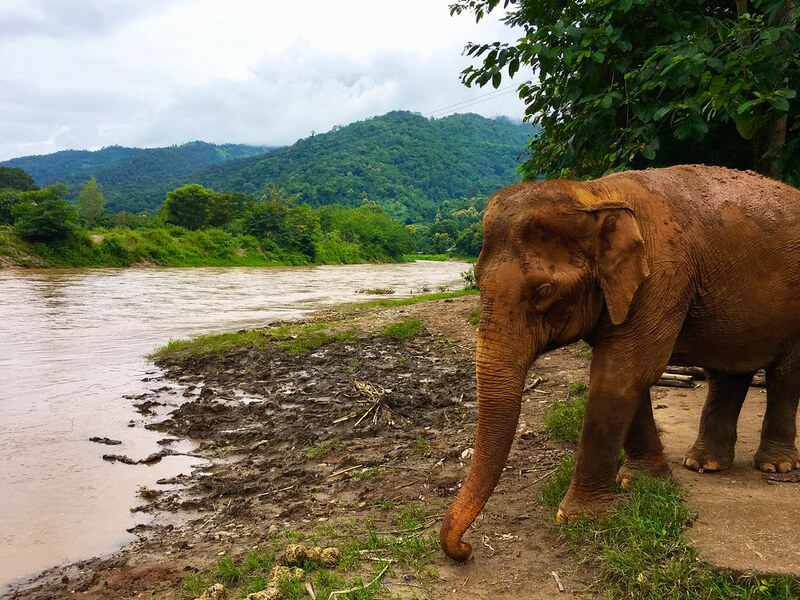 In addition to this post, I fully intend on writing a more comprehensive article on my experience at the Elephant Nature Park, which is one of the few responsible ways tourists can interact with elephants while simultaneously helping them. They rescue elephants from the tourism industry and give them a place to live where they are not chained, do not perform or work for people and instead get to live as close to the wild as they can, while being observed and fed/bathed by tourists. While elephants are trained at these facilities, it is only so they can receive medical treatments, and training is done with positive reinforcement and never pain. Mahouts at ENP are not allowed to use bull hooks or other instruments to get their elephants to listen to them. When looking for responsible options, it is important to keep in mind whether or not these facilities are actually sanctuaries or not. If they offer rides, shows, performances and so on, this is a big red flag. These facilities may “rescue” the elephant, but the life the elephant lives still is not ideal and would fall under irresponsible tourism for those who decide to visit. Just as hikers and campers venture into the wilderness with a pledge to leave it untouched, the same must be true for travelers wherever we go. Sustainable and responsible tourism are so much more than slogans or nice things to say. To travel mindfully is how we must all travel if we want to stop the abuse happening around the world not only to elephants, but animals of all types. These activities persist because of us. If we stopped buying tickets or patronizing the companies, they would no longer offer the activities. It is a slow and deliberative process, no doubt there, but it’s an important one. We as tourists are responsible for the reprehensible acts being committed to thousands of animals around the world. It simply has to stop so that future generations of elephants can live happily and we as human beings can live with ourselves. Such an important topic. One of my friends just started a travel company in Thailand and included riding elephants in the tour package. I sent him a bunch of info on it, and so glad he changed it to an ethical activity up in Chiang Mai.